The women’s World Cup ski races held in Killington will certainly become a great chapter in Vermont’s ski racing history! 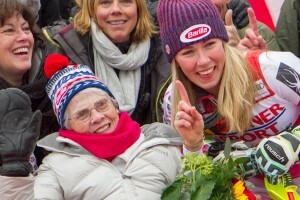 Mikaela Shiffrin came through under enormous pressure to win her sixth consecutive World Cup slalom. That pressure included her 95-year-old grandmother who had never seen Mikaela race in person before. All-in-all the event was a big success for Killington, for Vermont, and for New England skiing. 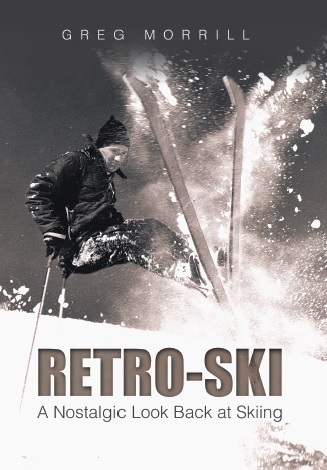 Back to 1978, Bob McKee called with the correct answer to last week’s trivia question identifying Phil Mahre as the winner of the men’s GS held at Stratton. Bob McKee knew the answer because he was in those 1978 World Cup races! Bob was skiing for the Irish Ski Team at that time. Bob’s main memory from those races was the bitter cold. He often trained with the Italian ski team and it was so cold for the GS that many of the Italians weren’t going to race. But then they went into a Stratton ski shop and bought the shop’s whole stock of face masks. Many of the Italians wore those masks for the GS race. Bob also remembers the snow that fell before the men’s slalom. The course was relatively flat and despite the efforts to remove the snow from the course, it was slow. Bob says that the racers had to skate to get across the finish line. One thing Bob didn’t remember from 1978 was that the women were also racing there at Stratton. The events were on separate days with the women’s GS on Thursday, the men’s GS on Friday, the men’s slalom on Saturday, and the women’s slalom on Sunday. But the women were definitely there! Maybe it was the Irish ski team’s rigorous training regimen that prevented Bob from knowing the women racers were there also. Both Bob McKee and Gary Fletcher recalled that Phil Mahre won the GS and his brother Steve won the slalom, a good family weekend for the Mahres. In both cases they beat the favored Ingemar Stenmark who finished third in the GS and second in the slalom. Both Bob and Gary also mentioned that Vermonter Cary Adgate had a very respectable seventh place in the GS. On the women’s side, Hanni Wenzel of Lichtenstein won the GS at Stratton and would go on to win the women’s 1978 overall World Cup. Perrine Pelen of France won the slalom. The best American woman was Cindy Nelson who finished sixth in GS and fifth in slalom. The Stratton results were the harbinger of things to come for the Mahre brothers. Phil and Steve are fraternal twins and Phil was born four minutes ahead of Steve. That difference in timing seemed to carry over to their skiing as Phil’s results usually were slightly better than Steve’s, but both were capable of winning as demonstrated at Stratton. 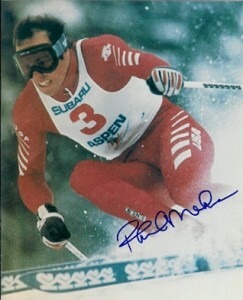 Phil would win the 1981 overall World Cup with Steve finishing fourth overall. In 1982 Phil again would win the overall and this time Steve placed third. Phil won his third consecutive overall World Cup in 1983, but that year Steve slipped to twelfth. 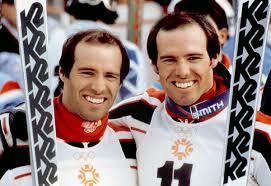 The twins would cap their careers in 1984 by winning gold and silver in the slalom at the Sarajevo Olympics. And yes, Phil got the gold and Steve the silver! The brothers’ relationship often confounded the Europeans. For example, at a 1981 race Phil was in a position to clinch the overall World Cup, but Steve came down and beat him. The Europeans couldn’t understand why a brother would do that. Phil did clinch the overall at a subsequent race.